The customer is a leading Infocomm Solution provider having verticals in Oil and Gas, Infocom, Fiber Optics etc. This particular division is into the Designing and manufacturing of Splicing Structure for Fiber Optics. In case of development of Splicing structure, it is essential that the product should pass various Tests ranging from Shock loading to Impact. With these expectations, it becomes essential to focus on designs which can be readily used with fewer number of prototype testing. The software used to perform analysis was ANSYS v14.5 Professional NLS. A 3D Assembly model of Splice Structure was created and analyzed for Various Tests: Shock Loading, Impact Loading (Equivalent Static Loading), Temperature Loading etc. The analysis was performed to determine whether the structure will withstand the Tests performed. 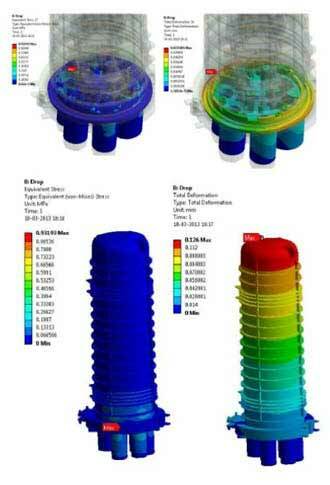 Assessment by FEA methodology shortened the Product Development Cycle by significant amount.